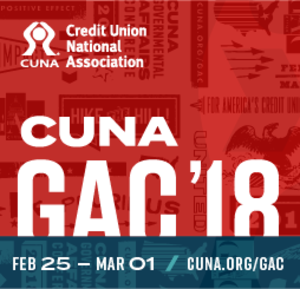 Our CUbroadcast Studio Lounge ventured cross country to Washington, D.C. for CUNA's 2018 Governmental Affairs Conference, February 24 - March 1, 2018. Once there, we interviewed GAC's expert presenters, credit union attendees, as well as industry innovators, game changers, and, of course, our fine CUNA hosts. And a special thank you to our mighty fine Studio Lounge sponsors CO-OP Financial Services, Corelation, LifeSteps Wallet, and LSC for supporting our conference coverage -- as well as our great hosts at CUNA. As a thank you, be sure to check them out when you get a chance.